Living in today’s world, it’s easy to forget that once, long ago, nearly everyone was a home worker and had to manage their own productivity. There were tradesmen — and women, of course — including iron and stone workers, carpenters, bakers, farmers, tailors and more. Many of them lived and worked in a building called a “workhome.” Essentially, it was both a residence and a storefront — or business property — for these tradesmen. There was no such thing as a flexible working trend, because it was their way of life. This setup existed for centuries — until the Industrial Revolution came along and the idea of automation was widely adopted. This is when large businesses and corporations boomed, as they replaced factory workers and manual laborers with machines and hardware that could enhance the manufacturing process. The people who were employed by these companies were required to work onsite, and generally with proprietary equipment and machinery. The idea of working from home, or merging a single space into both a living quarters and a business hub was largely forgotten. Of course, that doesn’t mean people didn’t work from home over the years. It just means it was no longer as common as it once was. What Is Remote Work or Telecommuting? The word “telecommuting,” which refers to working remotely from a space other than a “traditional” work environment, first appeared in 1972. A man named Jack Nilles was working for NASA on a communication system, and the bulk of his work was completed remotely, away from government property. Whenever someone asked what he did, he would simply reply that he was “telecommuting,” and the phrase ended up sticking around. Telecommuting (also known as “telework” or “working remotely”) is the practice of completing any amount of work away from company property. It can be done anywhere. For instance, you can do remote work at home, at a personal office somewhere, at a library, or even at a coffee shop. For Jack Nilles, however, telecommuting meant working from home. Of course, he wasn’t the first to ever do this, but that’s beside the point. Obviously, when he was around, the technology we have today didn’t exist — so he couldn’t work from a coffee shop. The term, and the practice, evolved considerably over the years. In 1992, the Interagency Telecommuting Pilot Project was born. The government adopted a telecommuting system for a number of federal workers, and the project was intended to popularize the idea. Then, in 1996, The National Telecommuting Initiative came into being. This increased the popularity of telecommuting immensely — more specifically, within federal agencies and the government. As you’d expect, this also boosted many telecommuting trends and inspired other companies and providers to follow suit. Since the growth of the World Wide Web and the internet sparked a communications revolution, it also helped fuel the modern telecommuting industry. Remote workers now had the ability to tap into company-owned resources, even while they were at home, through services like remote desktop software, cloud platforms and more. By 2009, telecommuting had become incredibly popular. The United States Office of Personnel Management reported that well over 100,000 federal employees had been working remotely by that year. What Industries Are Best Suited for Telecommuting and Remote Work? Today — especially with modern technology — it’s nearly impossible to classify every job or employment opportunity that would be ideal for remote work. There are probably companies and remote opportunities that even we aren’t familiar with and don’t know about. This speaks to the total size the telecommuting industry has grown to encompass, and the possibilities for many different industries. The option to communicate effectively with workers, and management, via electronic correspondence, including (but not limited to) email, IM platforms, text message, social media and VOIP software. The option to share work, documents and projects via cloud platforms, email or other platforms. The option to communicate effectively with clients, potential or current, using the same methods as you communicate with fellow workers and management. The option to work from a remote hub, which can consist of a personal computer, a company issued device or something else entirely (such as physical documents). The option to track time, work or project progress that is completed offsite. Take note: There is a variety of remote employment tools that can monitor this data. Of course, this list is not comprehensive. However, it does consist of the most important aspects of remote work. As long as you can scale your business to meet these needs — even in what is considered an unorthodox way — it is possible to create a successful remote venture. Please understand that just because it is possible to convert your business to a remote system, that doesn’t mean you should — or that you are guaranteed success. It takes a lot of behind-the-scenes work, including the right players, which we will go on to talk about later in our guide. When Did Remote Work Become Popular — and Why? Telecommuting has seen a number of booms over the years, but the most significant happened from 2009 to the present. There is no single defining purpose or factor of this boom, but a lot can be attributed to the growth of the communications and cloud services industry. Major players in the space have created some extremely powerful, efficient and relatively cheap tools to take work outside the office. Just to name a few, there’s Google Docs for business, Kanbanize, Asana, Skype and many more. We are barely scratching the surface here. Yes, it’s possible for telework and telecommuting teams to go wrong. But when things go right, it can result in improving the productivity of employees and lower costs for employers. An experiment by Stanford University scholars revealed full-time workers telecommuting were 13 percent more efficient than traditional workers, even though they had been promoted less. That’s good news, seeing how a growing number of employees now work remotely from home. More than 3.7 million employees (2.8% of the workforce) work from home at least half of the time. We’re not just throwing stats and numbers around haphazardly. 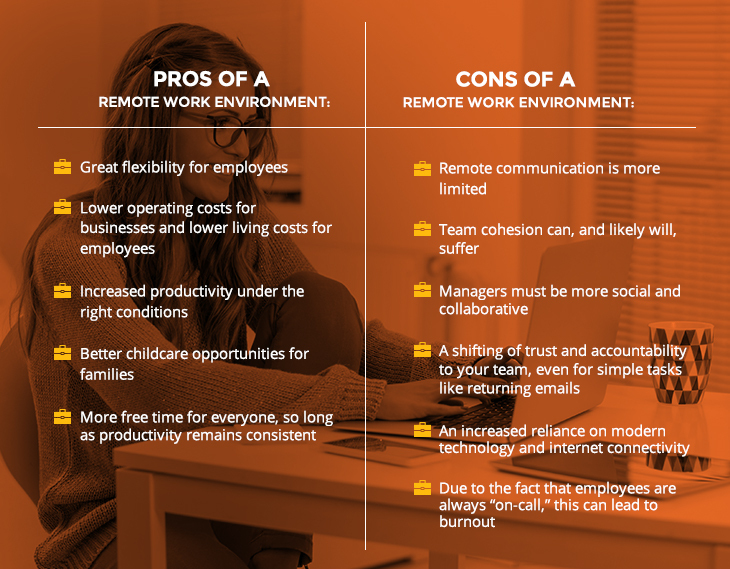 By the end of this guide, you’ll see just how effective a remote work environment can be. As for the “why,” that part is self-explanatory. Between lower operating costs, more effective workers and cheaper tools to get the work done, there’s no reason not to set up a remote working situation — granted it’s suitable for your business. On the employee side, it offers them more flexibility, lower expenses (because it eliminates the need for, and associated costs of, commuting), better childcare options and much more free time. The most important aspect of a remote environment is that communication channels will change. This obviously introduces a new set of challenges that traditional businesses don’t have to contend with. Face-to-face communication and in-person meetings are largely eliminated, unless you come up with a hybrid environment where employees work from home but must commute to a central location for correspondence. We’ll get to that strategy later. Just know that if you don’t adopt a strategy like it — and that’s okay – meetings and collaboration will take place in a digital space. Be prepared! It is possible to have face-to-face communication via tools like Skype, but that also adds a number of alternate factors. For example, Skype requires a reliable internet connection on both sides of a call. Without it, call quality can suffer and communication can end prematurely. Interrupted calls hinder productivity, but it’s no different from interruptions that occur during physical, in-office meetings. These remote communication challenges also contribute to a lack of general team cohesion. Employees working remotely on their own tasks and projects aren’t as aware of the grand picture. That leaves a lot of responsibility and weight on the shoulders of your management team. A remote team doesn’t necessarily call for more micromanagement than a traditional work environment, but it does require someone to be constantly aware of what’s going on across the company’s various projects. If the management team does not keep up with their end of the bargain, it can seriously hinder collaboration. Overall, this can lead to significant difficulties in keeping up with the individual developments across a team. Ultimately, this also means that individual members of a team may invest time doing work that is later scrapped or changed altogether. Collaborating in person doesn’t eliminate this problem altogether, but it does make the project much easier to monitor. You can check in with team members constantly and be sure they are on track and ready to meet their deadlines. Finally, a remote work environment relies heavily on accountability for all employees. Managers can always follow-up and stay in touch with their team, but individual members need to understand when to reach out. For example, if a particular employee is having trouble with their task, they need to be able to email the correct party for questions, progress reports and general guidance. To boil it down to the basics, remote work does not scale well for introverted employees. It is very much a social experience for all. Let’s briefly recap the pros and cons. This entry was posted in Kanban and tagged remote work on September 9, 2016 by Alex Novkov.